Compared to Jones/Baraka and Ginsberg, John Fles is something of a marginal figure. Yet in that 1959/1960 period (when this photo was taken), Fles could play the bongos with the Beat elite and do quite nicely thank you. Fles was on the editorial board at the Chicago Review when things got filthy on the Midway. He edited a one-shot called The Trembling Lamb during the first boom of the Mimeo Revolution alongside mags like Yugen and Big Table. Along with Jones/Baraka, Fles was one of the contributing editors to Kulchur. In short, Fles does not deserve to be cropped out of any recounting of that monumental year of 1959, when Beat went mainstream. Yet Fred Kaplan does not mention Fles in his history of the year that changed everything and I would suspect that Fles has managed to slip the minds of most, including those in the know about the Beats and the Mimeo Revolution. First Yugen published 1958. No. 4 was the best. The turning of the tide – or just before the surf breaks. (I was in town then, and remember.) Six full as a ripe wave, when I’d ride them in, at Laguna. With No. 7 we reach a plateau. Smooth water as far as you can see. I go home with the book on Friday, read it through, except the Marshall poem, and go to sleep considerably depressed. I see him bent against the wind; we’re crossing Seventh Avenue “in a few years I’ll have to put down poets using Creeley’s voice.” Or Marc’s admission, “… all seemed to me, on rereading, to’ve been written by the same person” (there were four or five concerned, including Mr. Jones). And they’re on top, kicking someone littler. Tired remnants of the thirties and everyone, anyone in his right mind knows it. Certainly the readers of Yugen. The sad part is, there energy’s there, waiting, to be used. Humor’s always a clue to what you do with it. II. That thought when certain things become predictable. Creeley’s rehash. Read Yugen Share This Poetic Reality. (Bessie Smith dies.) Artaud’s funnier than Olson. “Louder and funnier! !” Who’s the Dalai Lama? The former dean of Black Mountain College? The beauties of the Maximus Poems, however, before me. The other notes continue the Black Mountain tradition (“yii!”). The gaze, yes, is reverent. I’m straying from the point? Yugen is a magazine of poetry. Has it, too, uniformity of tone? Was the register the same? “A hand raised against the blossom is implicitly directed also, toward the root?” Was that whined? Shouldn’t the hand be raised at all? Jones is a great editor (one of the two or three in the country). His range and catholicism of taste; a continuum roughly from Olson to Corso. In each issue, also, a “discovery”; Meltzer, Bremser, Barbara Moraff “appeared mysteriously out of Paterson,” Rochelle Owens. 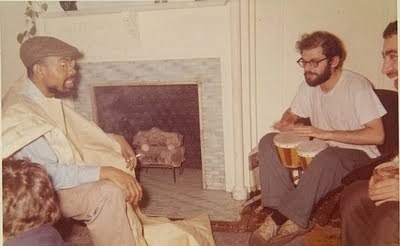 At the end Creeley opened his doors to Ginsberg, Kerouac, Corso. From that fusion to Evergreen Review No. 2. And so on – The New American Poetry 1945-1960. A NEW DAY COMING Yugen editor says. But stiffness of swing bands a “professional” publication. The new academy’s buildings are shinier, that’s all. A tradition becomes inept when – oh! III. It doesn’t matter, it doesn’t matter. Another generation drifts into town . . . What’s left for them? Allen? much shuffling of feet, attitude ambivalent, as it should be (the poet of our time). Burroughs remains firm. Jack not yet born. Gregory, yes. McClure. “I am close to Lawrence and Melville and find how much I despise Williams and Pound . . . If Olson’s is poetry of the intellect and physiology, I want a writing of the Emotions, intellect and physiology. The direct emotional statement from the body (from organs and from energy of movements) . . . I do not see with my senses but with forms and preconceptions thru custom. I will kick in the walls and make a destruction of those things.” Who’s he speaking to? All seven issues in front of me. Talk about evolution, yes. It’s only that, an early childhood experience, I’m abnormally sensitive to death by suffocation. 2. 2. “be done with these walking products of crime” is “stark poetry?” vice versa? Who is Gregory Corso? 3. 3. What about the problem of provincial (parochial) American poetry? 4. 4. What does Broom mean? Secession? transition? YUGEN?